The interior of the Copenhagen Schoolhouse at Naper Settlement as it appeared in 1870. While it’s a historically accurate replica, many of the materials used are from the original schoolhouse. Being both a filmmaker and owner of a Naperville-based production company about to move its operation into Downtown Naperville, every time I visit the grounds of Naper Settlement I continue to construct the storyline for a film which uses the Settlement as the setting. From a production standpoint, the interiors of each building are nearly film-ready in terms of production design down to the fine details. With just a bit of Hollywood-style magic, we could transform exteriors to a place which takes us far from the hustle and bustle of Downtown Naperville. One day I predict we will shoot that film. For now, anyone who doesn’t believe time travel is possible certainly hasn’t visited Naper Settlement. Sure, you may have driven by and seen the buildings, but if you haven’t stepped foot into these magical historically-preserved spaces you are truly missing out. The community, Naperville Heritage Society, the Museum Board and team over at the Settlement continues to do a terrific job preserving these treasures of our past bringing history to life year-round. For the past 26 years, the Naperville Exchange Club has produced Naperville Ribfest as a charitable event which donates 100% of net proceeds toward the prevention of child abuse and domestic violence. Prepare to be entertained and inspired as you journey behind-the-scenes of the Naperville Ribfest for an exclusive inside look at every aspect of this volunteer-run charitable BBQ and music festival. Behind Ribfest is a feature-length documentary film produced by my production company, Social Frequency Media Communications, and after making some rounds at film festivals we’ve decided to release the film online in two parts. We hope you’ll watch and share this film with others. Watch the film below or simply click here. Simply put, BBQ Rules! My regular readers over the years know that BBQ has been a way of life for me since my childhood growing up in Kentucky. 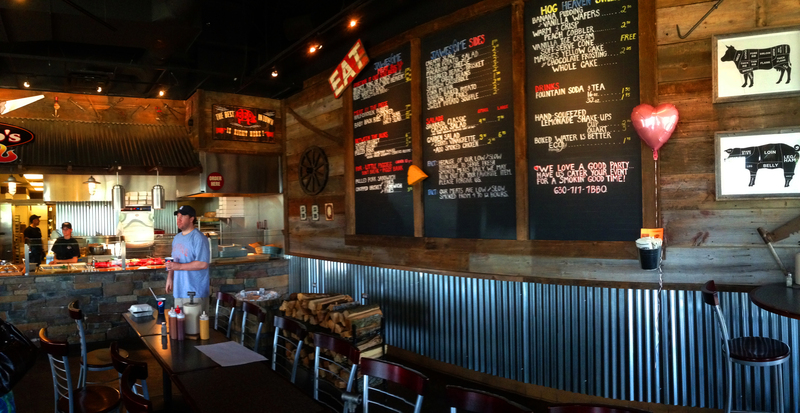 The continually growing interest in the art of BBQ is beginning to truly benefit us in Naperville as for the first time we are blessed with real deal low-and-slow pit BBQ restaurants which pay tribute to the great BBQ regions of America. Sharko’s BBQ has opened its family-owned doors in South Naperville (4931 South Route 59 in front of Caputo’s) and after two visits I’m pleased to say I’m hooked to yet another great BBQ joint. Asking me to name my favorite BBQ place is worse than asking me to name my favorite child, so there will be no comparisons here. Instead, I thought I’d share my 10 reasons to love Sharko’s BBQ. 10) The interior walls of the restaurant are boards from an old barn with sheet metal accents. 9) You can already smell the heavenly smokey hardwood aroma as you walk in from the parking lot which affirms the authenticity. 8) The complimentary self-serve soft-serve ice cream machine in the dining room which all of the kids love… especially us big kids. 7) You can buy meats, including ribs, by the ounce… a Texas tradition and great way to get just the right amount to satisfy any appetite. 6) Love beef brisket? 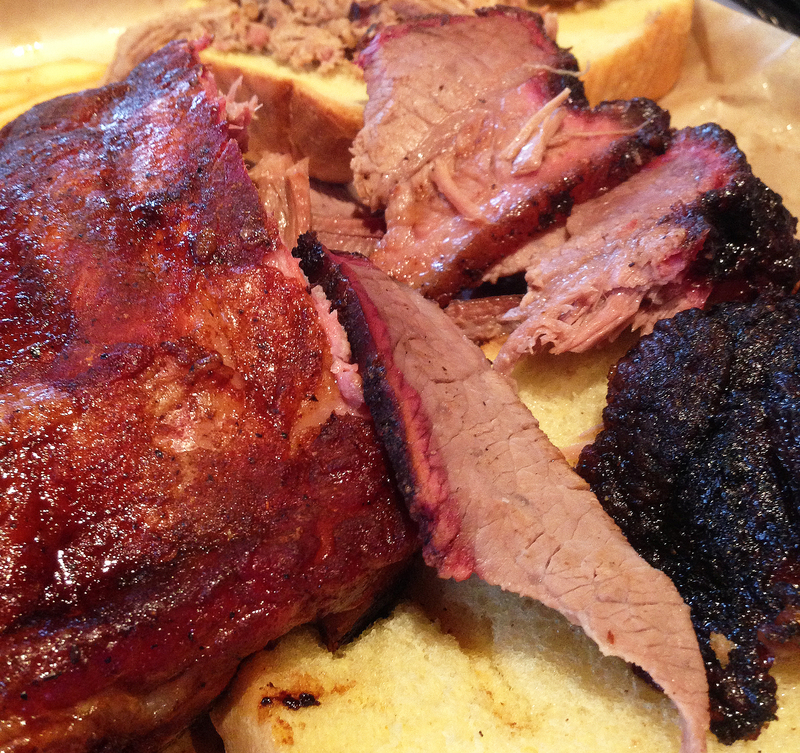 They slice it Texas-style… fresh off a whole brisket before your eyes. The brisket has a monster smoke ring, a sweet smokey bark, tender with just the right “tug” in the meat fibers. During both visits, owner Brian Sharko (hence “Sharko’s BBQ) gave me a couple of free cuts from the brisket point… a personal favorite for me. 5) The pulled pork is almost a hybrid between Carolina pulled and Georgia chopped yielding a nice moist and subtle smokey flavor. Speaking of flavor, whether Sharko’s injects their shoulders during the smoking process or adds some type of seasoning or mop sauce after pulling, the meat is so flavorful it would be a crime to add any sauce. 4) The regional BBQ sauces are delicious, but the meat is so flavorful you’ll find little need for the sauce… the measure of true BBQ. In some places in Texas, sauce is by request only and even then you’ll often get just a little cup. 3) The ribs… oh, the ribs… just the right amount of tug from the bone which affirms they were cooked correctly. Slightly a dry rib with a sweet and smokey outer bark and nice big bones from good quality cuts. A point of education as you might see the ribs pulled from the holding warmer in plastic wrap. Just about every BBQ restaurant wraps its ribs in this manner to seal in moisture as ribs can dry out fast. I’ll agree it’s a sight I would prefer to not see as I’m ordering, but I understand the importance. 2) Everything, including signs, are set up almost like a cafeteria/buffet which is also a tradition in some regions. It’s great to see how fresh the food is right before your eyes. 1) Sharko’s BBQ is owned and run by the Sharko family of Naperville. They have five kids and the family has been in the restaurant and catering business for a very long time. An interesting point of trivia, Brian’s dad actually won 1st place for Best Sauce at the very first Ribfest over 25 years ago. Okay, so I capped my overview at 10 reasons, but there are still great features like the saddle stools along the outer wall, thick-cut texas toast bread, the Pig Juice Sauce, the hand washing sink near the dining room, the perennial BBQ dessert standard… Banana Pudding and allot more. In a nutshell, I give Sharko’s BBQ my full recommendation and look forward to them being a part of the growing Naperville BBQ lineup for many years to come! 10 Reasons Why I Love Naperville Magazine and You Should Too!